" ...cursed be the congregations, choirmasters and organists who do not listen to Martin!" During the first half of the 20th Century, in a pre-media era, historical pageants were widely performed as a way to bring the past to life. Martin Shaw, always keen to be involved with projects for the people, wrote music for two high profile pageants: The Rock (T S Eliot), and Judgement at Chelmsford (Charles Williams, the poet who most influenced WH Auden). Sections of the above works will be performed by a chamber ensemble at the conference, which takes place at St Leonard's Chapel, off South Street, in St Andrew's, Scotland. Entrance: free. Click HERE for more details. Discover the intriguing life and music of Dr Martin Shaw, possibly the most prolific composer of his day. One of a bohemian set of Chelsea artists and actors at the dawn of the 20th Century, he was Director of Music for the tragic Isadora Duncan, influenced the emergent 'Englishness' of music at the time; composed for people from all walks of life: for a choir of 400 singers to professional soloists to small children; was admired by his fellow composers and, at the end of his life, the young Benjamin Britten, who asked him to compose a piece for the first Aldeburgh Festival. 100 letters to and from Martin Shaw. Correspondents include Ralph Vaughan Williams, T S Eliot, Benjamin Britten, Edward Gordon Craig, Maude Royden and many others. Written for the Three Choirs Festival, it had its first performance that year in Worcester. Elgar took a great interest in the piece, writing to Shaw to let him know it had arrived safely from the publishers. Elgar also paid for Shaw to stay at his club in Worcester for the duration of the Festival. Peter Maxwell of Cramer Music says: "Playing the first movement back of Water Folk “The Stranger” [I saw] that it was like a Britten style or certainly that kind of instrumental combination. Britten was obviously influenced by Martin Shaw! ...I can certainly see this coupled in with a Britten and/or V.W. concert." Songs from The Airmen: Songs originally published with Cramer on the CD are available to singers as archive copies from trade@cramermusic.co.uk. Cramer published Shaw's songs from 1923 onwards. 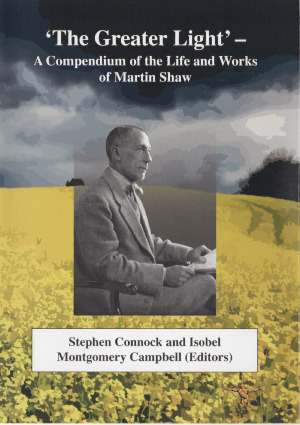 The Changing Year is now available from Stainer and Bell. A secular cantata, written for the Festival of Britain in 1951, it was first performed at Colchester. As with Shaw's oratorio The Redeemer, the words are chosen from the canon of English verse by Shaw's wife, Joan Cobbold. (45 mins). Recording made in 1975 by the Broadheath Singers with the Winsor Sinfonia, conducted by Robert Tucker. Full recording available on request.